Fanart of Asriel from Undertale! What a cool game. EDIT: Since quite a few people have asked me now, yes you may cosplay this design! And feel free to send me pics of the finished thing, I'm very interested and flattered that you'd choose to make this. Facebook | Tumblr | <-- Click these for process pics and other fun stuff! This is too Wonderful, your a great artist! Can I copy your art work? I'll leave in the discription that your the original creator I'll do it in By hands plz? So so wonderful right here! It's just so....great looking really ah so so great! I'd love to see much more action like drawings from you! Greetings, I was wondering if i could use this in a video? I happen to like this design not just because it looks totally epic, edgy and dark (reflecting Asriel's mood at the time) but also because it's a take on Asriel's most powerful form that I have never seen in fan art before! Most people seem to think (my past self included) that when Asriel's like this, his body becomes segmented and strangely altered, the different pieces only held together by his godlike power. I'm not sure I've ever considered the possibility that maybe he isn't horribly distorted in this "Angel of Death" form, but rather wearing an outfit that represents his role in the Delta Prophecy AND makes him look super cool. Of course, maybe the fact that his sprite is huge in that section of the game gives the implication of a monstrous form (no pun intended). As for saying that Asriel looks nothing like this, well...I believe I've already said all that needs to be said. Thanks for the nice comment! I'm glad you like this interpretation of his design. "Do you Hope to kill, or do you Dream about being killed?" It's like halfway between his "Asriel Dreemurr" and "Asriel, Absolute God of Hyperdeath" forms, and really well executed. I love it. 11/10. Is it alright that I'm using this as my phone wallpaper? I always liked adult Asriel's design, your interepretation looks even better if a bit too much dark for the story, hehehe. This is an awesome interpretation of Asriel, becoming darker without crossing the edge into being too dark. I love this picture! Not only does he look cool, but also really really scary, like a real demon! 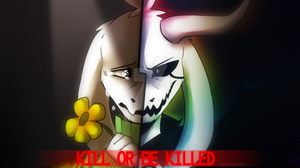 You would not want to meet this Asriel in the dead of the night. Hey, just to let you know that someone on DeviantART by the name of CookieNoob23 stole it: cookienoob23.deviantart.com/ar… I first thought that they made it, but another user told me that it was yours. Thanks for the heads up! It seems to have been removed already. I always have to think of Deathstep music when I see this picture xD Very good!! OMG!!! I'm crying of happiness yay! Oh I am LOVING the Chaos Sabre here; reminiscent of Ganondorf's sword from Twilight Princess. And then he gets downed by a near-mute little child.